Back in 2018, Nike wowed and amazed sneakerheads with their brand new react technology which was a midsole technology developed in reaction to Adidas Boost. 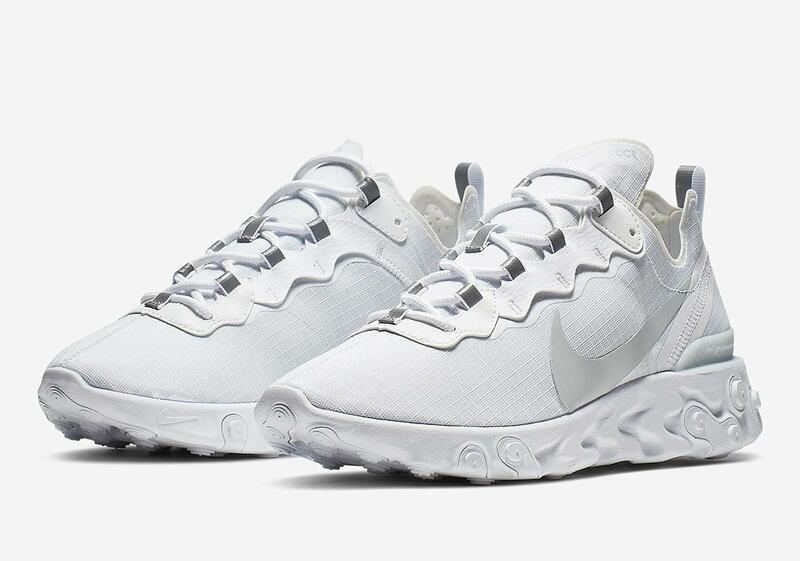 So far the react Element 87 and the Element 55 have done well on the market as comfortable lifestyle shoes that look pretty dynamic on-feet. Unlike the 87, the 55 doesn't have a translucent upper although because of this, Nike has made the 55 more widely available as the 87 colorways tend to sell out instantly. We've seen a few colorways of the 55 recently and now Nike is giving the shoe the all-white treatment, something that comes to pretty well every shoe. Considering this is an all-white shoe, there really isn't much to say here other than the fact that these are super clean. If you've been put off by the colorful versions of the React Element 55 and were waiting for something a lot sleeker, these are definitely for you. If you're looking for a summer shoe that you can walk around in for long periods of time, these will be a great addition to your collection. According to Sneaker News, these will cost $130 USD and should be released on Nike.com in a few weeks.